Game Preview: The @OHLBarrieColts vs @OHLSteelheads! #OHL - Very Barrie Colts | A website covering the Barrie Colts of the OHL. Tonight the Barrie Colts welcome the Mississauga Steelheads to Barrie Molson Centre for the 5th meeting this season of 6. So far, the Colts have won all 4 games against Mississauga and have out scored the Steelheads 19 to 8 in those games. The last meeting was on February 6th at the Hershey Centre which saw the Colts win 5-4. Both Brendan Lemieux and Joseph Blandisi scored 2 goals in that game while Kevin Labanc got 3 helpers. Mackenzie Blackwood saved 35 of 39 shots faced and the team was able to take advantage of the Steelheads through special teams. Both teams had 7 chances on the power play but the Barrie Colts were able to score on 3 of those chances. Tonight they will look to extend their winning record against the Steelheads to 5 games this season. Mississauga is coming off of a 4-2 loss against Niagara this past Thursday. Despite trailing the IceDogs 3-0 at one point, the Steelheads managed to make it a close game but were unable to get the win. Sean Day had a solid performance for Mississauga contributing a goal and an assist and he was the only player on the team to end the night with a plus rating. The Steelheads currently sit in 9th place in the Eastern Conference and trail Peterborough by 5 points with two games in hand. They will no doubt be hungry to get some fish food tonight.. I MEAN POINTS, POINTS! Lets not forget that they are also on a 7 game losing streak that they will be ready to end tonight if the Colts give them the chance. Barrie is coming off of a tough loss against North Bay on Thursday. They started out with a 2 goal lead but the Battalion would rally back and go on to score 4 unanswered goals to get the 4-2 win. The Colts are fighting to keep their spot above the Battalion in the standings where they currently have a 5 point lead with one game in hand. 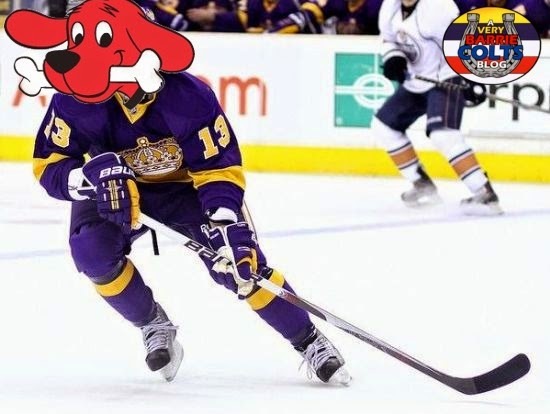 North Bay is playing the IceDogs tonight in Niagara. Keys to Success: Barrie clearly has had the edge over Mississauga all season. The most important thing tonight will be just to stick to their game plan. The Steelheads are hungry for points and the Colts can't look at tonight as a guaranteed win just because of the record against them already. Lots of shots has helped them in the previous meetings and they will want to carry that into tonight. Oh, and STAY OUT OF THE PENALTY BOX! I know, this is crazy thinking but it COULD WORK! Players to Watch: Andrew Mangiapane has 6 points in 4 games played against Mississauga this season. He also has 17 points in the month of February and no doubt he would like to add to that point total to end this month on a high note! Blandisi also has 21 points in February. He is still in the race to be the scoring leader and though there is a gap it is still a possibility he could make the top of the list. In 16 games this season he has games with 3 or more points. A few of those in a row could help him climb the ladder! The game is set to start at 7:30 tonight at BMC. Tonight is also featured alumni night at BMC where the Colts will remember former Colt and current LA King, Kyle Clifford!